Test your knowledge of United States trivia with this set of 150 fascinating facts. From the number of columns on the Lincoln Memorial to the only all-American sport, the USA is full of fascinating trivia. 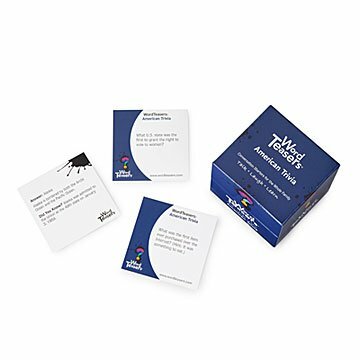 Test your knowledge of the Land of the Free with this set of 150 intriguing, amusing, and downright quirky fact cards. It's great family fun for players age 8 and up. Made in China. I bought this for when we go out to dinner and are waiting for our food. It's challenging yet fun and educational. Most of the time my kids are reading books, and so engrossed they don't want to talk. With this game we are all socializing. I Really enjoyed this product!! Great Fun for one or many! Can be made into a game like Trivial Pursuit, or a time passing cartrip game for the whole family!